Looking for epic Christmas gifts can be a challenge, especially when your loved one is a complete adrenaline junkie. Well, now you can push their nerves to the absolute limit with these skydiving gift ideas. With a number of skydiving gifts available this Christmas, we thought we’d put this handy guide together to help you choose that perfect gift. Go tandem, go solo or go for the Christmas gift voucher – we’ll explain all below. All gifts purchased are for our dropzone here near Bridlington, Yorkshire. It’s Yorkshire’s only dropzone, plus we offer breathtaking views of the Yorkshire Coast! Solo or tandem skydiving, which one should I choose? Ultimately, the recipient of your Christmas gift will be leaping from a plane with either solo or tandem, but which one you choose depends on how they’ll do it! Tandem skydiving is the easiest and most common way to experience skydiving. 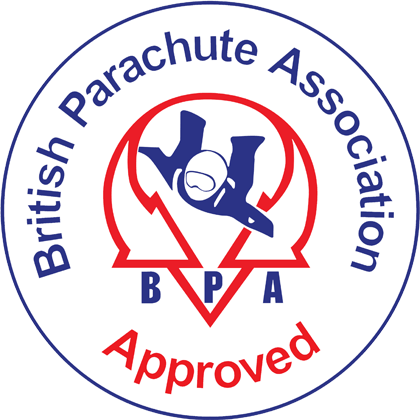 After a short training session, your loved one will be safely harnessed to a qualified skydiving instructor and taking the leap whilst they do all the hard work. Go visit our tandem skydiving page to discover more about what’s included and what to expect. Solo skydiving is much more intensive as it involves a ground school of 6+ hours before the jump. 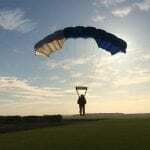 However, the rewards are huge as it’s the first steps to becoming a qualified solo skydiver. Go visit our learn to skydive page to discover more about the thrills of solo skydiving. Christmas vouchers that are perfect Christmas gifts! So now you know the difference, it’s time to see what skydive gift vouchers we have available! Prices start from as little as £49, right up to the full cost of a skydive plus photo and video packages too. All vouchers are sent our electronically, so we’ll send you it shortly after you’ve purchased. Then, you simple print it out and you’re done! When it comes to booking in, all the recipient has to do is give us the unique code which is visible on the voucher. All vouchers (apart from the Christmas offer) are valid for 12 months from the date of purchase. Only £199, a saving of £50! 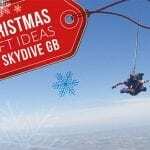 Our most popular skydiving Christmas gift has to be the £199 deal, which is available to buy right up to and including Christmas eve – perfect if you’re a bit last minute! Like all deals there are a couple of additional terms. In short, the skydive needs to be booked by the end of January 2019, with the skydive to take place before the end of March. Not enough time? They can always upgrade the voucher to the full year if they wish, for an additional cost. If you prefer something that little bit cheaper then there’s always the £49 option. This acts as the deposit, then the balance is simply payable on the day of the jump. The balance does depend on when they choose to jump, but if it’s on a weekend with no additional photo/video packages then the balance would be £200. Prefer paying for the full thing? What an awesome person you are! 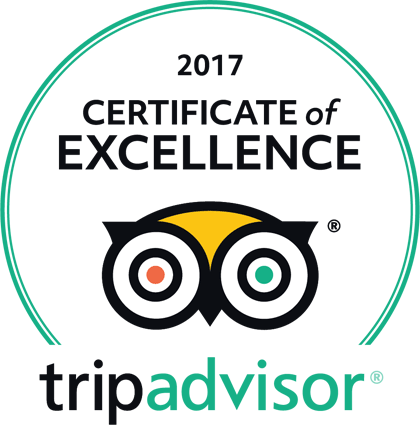 We have gift vouchers available right up to to the full weekend cost (£249) or if on a Friday (£209). This will be valid for 12 months and like all our vouchers would be sent via email as an e-voucher. You can then just print it out and gift it – easy peasy! Tandem skydiving gift voucher + get it filmed! The top of the bunch in our Christmas gift vouchers for skydiving has to be the this. Here you’ll gift a full tandem skydive experience, plus you can add one of our media packages too. I mean, if they’re going to jump from a plane they might as well get if professionally filmed, right?! You have a couple of options here, the silver package it £75. Or the gold package is £99. You can go take a look at the media examples to see what the full differences are. Again, these will be valid for 12 months and sent as an e-voucher to your email address. So, you’re thinking of gifting a solo ground school this Christmas? Awesome! With the £49 voucher you’re simply covering the deposit, so they can use this when booking in on a course. The balance will be payable on the day at reception. If you fancy paying for the full course then it’s only £199, which covers everything! The action packed ground school plus the adrenaline fuelled first solo parachute jump. We have a number of courses throughout the year, with the first one on 12 January 2019. Just book it in as a surprise! So forget the Christmas vouchers, you just want to book it in with a date and surprise them on the day. It’s hilarious when we see people turn up at reception having only just found out what’s about to happen. If you dare to do that to your loved one, then we’re up for it too! All you need to do is go straight over to the booking page and get it booked in for a date of your choosing. SImply pay a non-refundable deposit of £49 and then the balance on the day at reception. But just a heads up, make sure they fit within the minimum restrictions, and that you believe they’ll be able to sign the medical declaration of fitness. If not, it’s going to a little bit embarrassing on the day and we wouldn’t want you to have a wasted journey. The dull bit, but probably worth a read! Tandem skydiving – The minimum age is 16 (with parental permission required if under the age of 18) and the maximum weight is 15 stone. There are a few medical restrictions too, but you can find more information on these here. Solo skydiving – The minimum age is 16 (with parental permission required if under the age of 18) and the maximum weight is 14 stone. There are a few medical restrictions too, but you can find more information on these here. 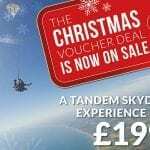 The tandem Christmas voucher deal – Like all deals, there are some additional terms and conditions with the deal. In short, the skydive needs to be booked by the end of January 2019, with the skydive to take place before the end of March. Not enough time? They can always upgrade the voucher to the full year if they wish, for an additional cost. And finally, all bookings are subject to our usual terms, which you can find here.